a night of wind and heavy rain couldn’t stop the people of Todmorden from attending the lighting up of Todmorden Unitarian Church’s bell tower. Light Fandango celebrated the switching on of the flood lighting for the bell tower of Todmorden’s grade one listed Unitarian Church. 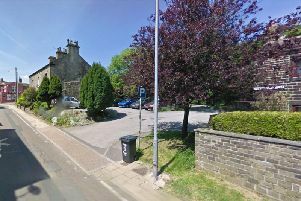 Over 100 people attended the event which hopes to ensure the spire of Todmorden Unitarian Church is a landmark of the Calder Valley at night as well as during the day. Visitors enjoyed refreshments and traditional pie and peas from Todmorden Market’s pie man, Tony from Ham Corner. Music was provided by Dr Butler’s Hatstand Medicine Band and Tim Caswell also performed his song written especially for Calderdale. Organisers would like to thank Todmorden Town Council, Todmorden Pride, Todmorden Development board and Calderdale Metropolitan Borough Council for funding and local residents Nick Lunn, Kez Wainwright and Geoff Shepherd for installing the lights.